Well, folks, it's the new year and it's a new month. And every time we enter a new month, we comb through the app stores to see what great new apps have come out over the past 30 days. Needless to say, December saw tons of new offerings in both stores, so we had some sorting to do. We've got two new experimental apps by Google released for iOS, an app that automatically makes an emoji out of your face, a couple of cool synth apps for iOS musicians, a file manager by Google that can clean up the junk files on your Android device with a tap, and much more. Check them out below, let us know which one you liked, and whether we happened to miss a cool new app that came out in December! This app is a mix between painting and photo editing. It makes full use of the Apple Pencil, if you happen to have an iPad Pro, and has tons and tons of features, including layers, blending, gradients, symmetry lines, image resizing, and lots more. An experimental app by Google with a simple concept. First, you record a video. Then, you have to swipe your finger across the display in order to make the video play forward and back. If you do the swipe with two fingers, the app will “record” you scrubbing back and forth through the video and will export what you see on screen into a clip that you can share. A bit too simple, a bit too odd, but we are curious where Google intends to take this. A cinemagraph is a still photo that has a part of it moving, creating that trippy “it's a clip but it's not” effect. This app lets you quickly and easily create such media. Ever seen Bitmoji? It's the app that lets you make an emoji version of you by manually setting your facial features, hair, and so on. Mirror Emoji does this automatically from a selfie. Then puts your emoji in a bunch of stickers that you can either share manually or use the keyboard that the app comes with. Another experiment by Google. This is a selfie cam that will take photos automatically when you make a pose. That's it. This app lets you quickly create presentations on the fly by pasting images, files, or links into it. Your collaborative team can review the presentations as you are sharing the new content and can react, comment, or even initiate votes over the material. A smart calculator that does all the math for you. All you need to do is take a photo of the problem you are facing. This is the sequel and update to Time — one of the most popular time-management apps for iOS. Basically, it's a great assistant to stop you from procrastinating and help you finish your projects or your work on time. 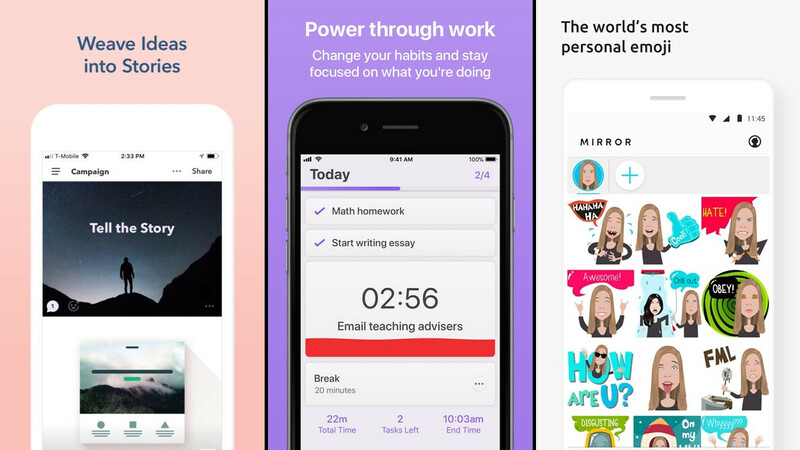 It's not a miracle worker, though — you have to want to stop procrastinating for this app to be able to help you! A sampler, beatmaker, and DAW all in one. A great tool for mobile iOS musicians. You've got 64 tracks max, live performance mode, AudioCopy and AudioPaste support for easier composing, and lots more. Another one for the mobile musicians, Lo-Fly adds character to already existing sounds. It's just an external effect that can add some lo-fi grit to your instruments. A storage manager made by none other than Google. It's supposed to help you quickly find files, quickly clean up junk to free up space, access and upload to your cloud, et cetera. A web wrapper that will let you experience Facebook the way you choose. You can theme it how you like, you can download the videos, have a data saver on, or block ads. Also, it's Facebook and Messenger in one app. A new competitor on the cloud gaming scene. GloudGames is here to let you enjoy console and PC games straight on your phone. It's a service, which uses powerful PCs to render the games and streams them to your phone. “Gaming from a distance” is probably a good way to call it. This app taps into all of the phone's sensors to make it an elaborate security system. It can use the camera to detect intruders, the microphone to pick up noises, the ambient sensor to detect light changes, and even alert you if the power is out (if the phone is plugged in). Going to sleep and waking up to music being on is always cool, but why not have it silence itself when you are actually sleeping? SpotOn will play and pause your Spotify at the specific times you set for it. This app lets you create a reminder from anything shareable. It adds a “Remind Me” button in your share menu. So, if you go to share a picture and tap Remind Me, you can now have that photo set as a specific reminder at a time of your choice.